Just in time for Summer, here’s a design for a sonic pest repeller. Carla Schroder developed this project which uses an Arduino Uno along with the WAVE shield and a Maxbotix ultrasonic rangefinder. This simple yet reportedly effective design senses critters nearing your garden plot and plays sound files (stored on an SD card) intended to irritate and repel the invaders. 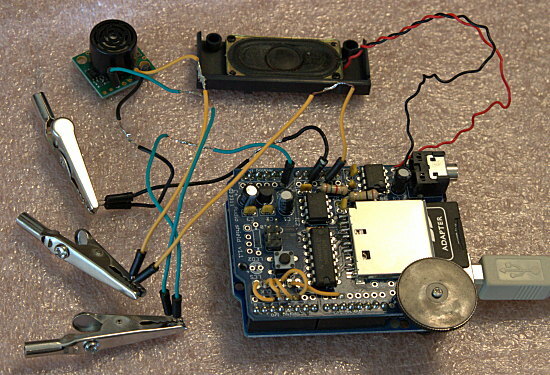 This entry was posted on Monday, June 9th, 2014 at 12:01 am	and is filed under Arduino, open source, sensors. You can follow any responses to this entry through the RSS 2.0 feed. You can skip to the end and leave a response. Pinging is currently not allowed. And here is a pot of gold. Finding the actual location is left as an exercise to the re^Wposter.